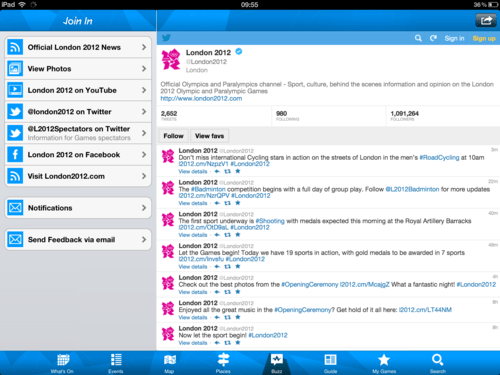 London 2012 Olympics iPad app [UX Review] - Harold Tor. 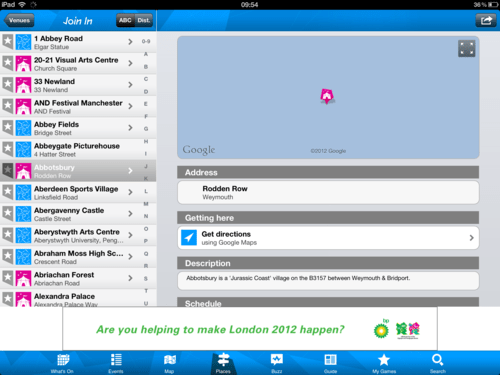 The London 2012 Olympics iPad app is a pretty nifty one. There is another app called Results but that is more for people checking out the results of each event. This app is entitled “Join In”, seems to be geared mostly towards people who are there in person. But it is done in a way that does not exclude the ordinary user who just want to follow the games at home (like myself). I will explain why later on. Let me guide you through the app, and at each step, talk about the UI and UX of each category and in general. Once open, the app shows a clear menu bar at the bottom, with 8 categories: What’s On, Events, Map, Places, Buzz, Guide, My Games, Search. A good UI would be to lessen the layers that a user needs to dive into, while not presenting too many choices at the top level. Each category needs to be self-explanatory and distinct from the next. As an iPad app, the app needs to make full use of the capacities and functions of the device, and caters to and offers the user the use of these communication and utilitarian advantages. There are two panels that are more or less consistent throughout the app. The left panel is a list of choices while the right panel displays details of any selected choice. 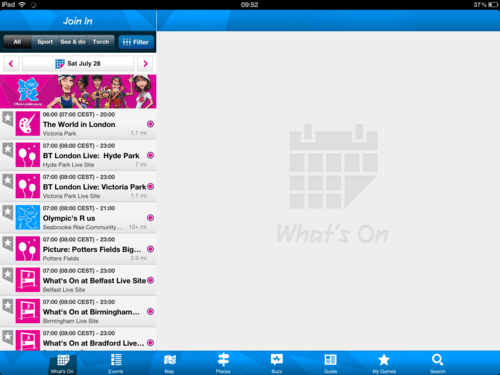 Once open, the app opens up What’s On, displays the events of the day. 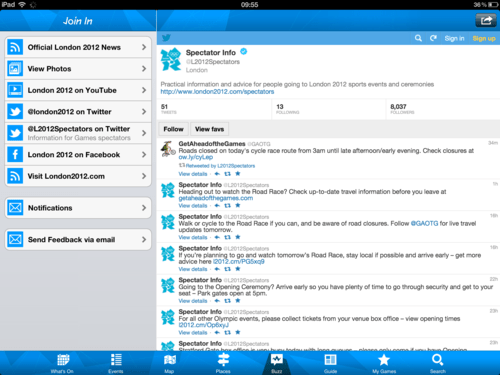 One can filter through the events to select only sports events, or display tourist events. Good points: I have the flexibility of selecting the events I want to see. As an onsite user, I see other things I can do apart from sports events which I do not have the tickets for. I can even check out events in the future so that I can plan my trip well. Bad points: The app opens up in absolute blankness, until you select an event so that details can be displayed in the larger panel. Maybe instead of opening up in a Home panel of moving pictures of interesting future events, or of ways one can use the app. 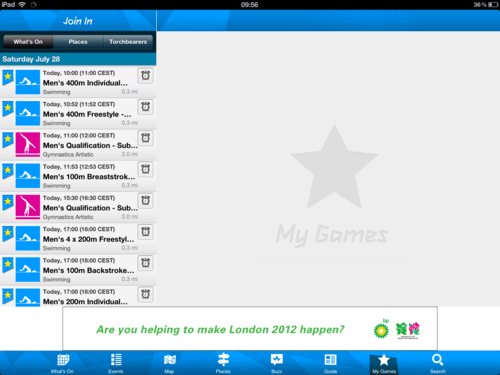 Good points: All details of the events are available on the page and iPad functionalities are included. 1) Mapping function: location of the event is clearly shown 2) Journey planning: the ability to plan one’s journey from one place to another within the Olympics compound 3) Photo and video functions: one is able to view any pictures or video related to the event 4) Sharing functions: one can share a photo via Twitter as well as share the event on Facebook etc. 5) Shopping: merchandise linked to an event is displayed on the page itself which is linked to the purchase page of the London 2012 gift shop website. Bad points: Information is displayed linearly and is unwieldy and unattractive for the user. I can literally see the data that is being drawn out from a database rather than looking at an event guide that aims to attract me. For a non-technical person, even though all the information is there, it all looks like an alphabet and number soup. The category Map is literally one map that shows the Greater London region, with pins of Event locations. When one clicks on a pin, it opens up a page containing: the venue information, map of venue, Getting here, Weather forecast. Good points: I thought the weather information was a vital information, knowing how much it rains in London. It even tells you the UV ray level today and tomorrow! Bad points: This was a bad surprise. I thought the venue address should be there. I clicked on Getting here it gave me the route from my location to the venue (Clearly a good function for onsite visitors). But where’s the address? I clicked on the venue icon under Venue Information and it then led me to ANOTHER page with more information: About this place (containing all the visitor information including address), Getting here, Venue maps, Schedule (of events to be held there), Weather forecast. Why was THIS page hidden behind that first page, which was clearly unnecessary? I could have missed all this vital information! The category Places opens up with a list of places in the left panel and a blankness in the larger right panel. It contains not only event venues but also Cash machines, Art venues etc, where non-sports events are taking place. When a venue is selected, the information is displayed in the right panel. The information displayed contains all the vital information you need, including the schedule and media files, the same page in the deeper level of the previous category. Good points: Clear information. I like the fact that there are tips about the venue and what to expect as a visitor when you are there, and the information is not a generic one but written specifically for each venue. The maps are really detailed. They show the access points and seating blocks. Bad points: The same critique as above. Unattractive, straight from the database. Apparently, according to the app’s Guide, you can drop a pin as to where you are so that your friends can find you there. Exactly as to how this works in this category baffles me. The category Buzz fully shows the sharp contrast between London and Beijing! In this category, one can access the latest news via RSS feeds, view and share photos, communicate via the two official Twitter accounts, like them on Facebook and watch their videos on Youtube. WOW!!! Good points: One doesn’t have to change apps to tweet or like a Youtube video. Everything can be done directly in the app itself. All the communication functions that one uses the iPad for, there they are, in this category. Bad points: Apart from the unattractive UI, the functionalities are there! The official colour of the London Olympics is that hideous purple. I see them trying some other colours here: Blue background etc. But the Twitter icons have various colours and so are the different information groups here in this app. Erm, who the hell is your graphic designer??? 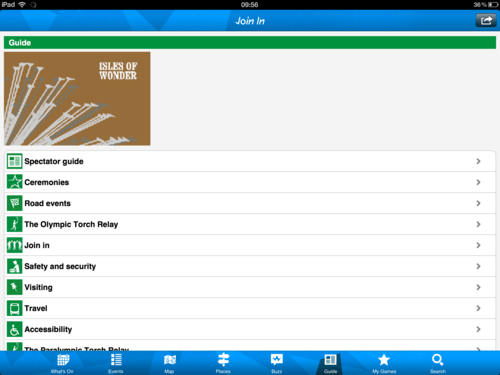 Guide is the “guide” to the whole Olympics, minus the sports events. Here, you get information as a spectator, the ceremonies, safety and ticketing information etc. Good points: Ample information. The Brits are really good at gathering information and presenting them in clear concise language. Bad points: LOOK AT THE HORRIBLE UI! Image too small for the panel. A huge amount of blankness. There are a lot of words but very little visual aid. Maybe a video can help out a visitor more than your alphabet soup? I can imagine the information was lifted directly from the printed guide (no thanks to the traditional media mafia directing this whole operation). I love the fact that I can pick and choose the games I want to follow and have them all accessible in the My Games category! 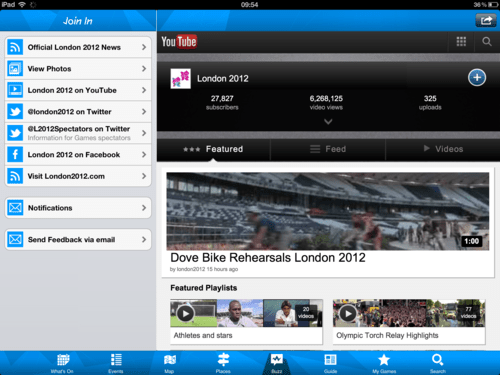 This feature is really useful not only for onsite users, but also for guys like me following the Olympics at home. Good points: I like it that I am able to access my past events as well as the future ones. This means I can view photos and videos from the games. 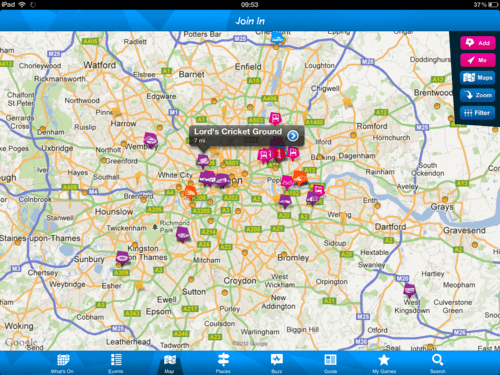 You are able to search for venues, events etc and the results are filtered into What’s On, Torchbearers and Venues. I tried searching with a country name and it popped up in the What’s on results. I tried with a sports, it did that too (not in the venue). Then I tried searching with a venue name (Wimbledon), it then showed the different venues of that name. Bad points: But the developer seems to think users only search for an Event or Venue. Maybe they designed the app mostly for onsite users. What about athletes or countries? What about tweets or news related to an event? Either that or the developer only thought linearly about the information architecture in his database and how he could streamline that information into search results. A well-rounded search is more useful for the user. Think Google search, that’s why no one uses Yahoo search anymore. There are several things which are commendable about this app. 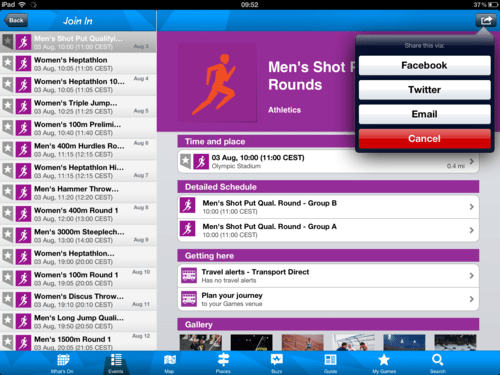 It is the FIRST iPad app developed for the Olympics! With the information freedom that London offers and the savviness of the London population in social media, the app is a great tool and very much welcomed to be an essential app for any spectator or followers at home. The amount of information to be put together to be rewritten and redeveloped for the app must have been a gigantic task. Bravo to the development team! Nevertheless, there are some places for improvement. I can tell this app is more a developer’s input more than a designer’s input. The attractiveness and presentation of information are atrocious. Either a good designer was not consulted or he should be shot (Very much the same case for the designer of the London 2012 logo). Likewise a UX consultant was obviously not consulted. User experience is essential in the development of any app, from the usage to the language used. There are areas that are lifted wholesale from print media, which repels the user rather than help them. Last of all, the user group is clearly onsite visitors rather than (or also) home users. There are clearly information which I am missing because there is so much focus on the onsite visitor: athlete profiles, country team profiles, Olympics records, World records etc. I know there is another app called Results, but why have two apps? Many of the information in this app are repetitious, the menu could be shortened and simplified and the app could be combined with the results and profiles. The Olympics being an international event, this app should have been available in not just English but also in major world languages like Chinese, Russian, Spanish and Arabic.